Back in the 1980s, gamers would laboriously hand-edit autoexec.bat files to squeeze every kilobyte of RAM they could from their cutting-edge 80286 boxes. Today, we have computers to do that for us. The free Game Booster 1.0 frees you from special boot floppies, by looking for unnecessary processes (such as a tablet driver when you don't have a tablet PC) and turning them, temporarily, off. You can easily turn them on again by exiting "Game Mode." There's really not much more to it than that. 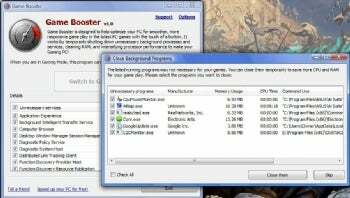 You have control over which processes to turn off, and Game Booster also checks for programs which do not seem to be essential for running games. I verified that the processes selected terminated and started as expected. As to how much of a boost you will get... that depends on how close to the edge your system runs. I regained some 300 meg of memory, a fair chunk, but on a 4 gig system, I rarely end up page swapping when running games, unless I very deliberately try to fill up RAM. Those on lower end systems may find the effect to be quite noticeable. Note: I have had no problems with this program or with other, similar, "performance tuners". Other users sometimes report issues with performance-tweaking software . While it is very unlikely this program's actions could cause any problem that couldn't be solved with a simple reboot, as with any program which changes running processes, use it cautiously. Make a system restore point before trying it out, just in case.